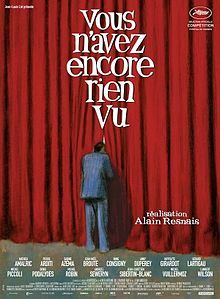 One of Alain Resnais's final films, YOU AIN'T SEEN NOTHING YET is playing on MUBI on Monday along with LAST YEAR AT MARIENBAD (Saturday) and STAVITSKY...(Sunday). Since I'm guessing most of you haven't heard of the film, much less have actually watched it I'm reposting my review fro 2012's New York Film Festival. To see YOU AIN'T SEEN NOTHING YET go here.